In March 12, 2019 First-year students were given an excursion to the Logistics Company DB Schenker, which is considered to be the leader in the global transport sector. JSC Schenker Managing Director Edmundas Daukantas and Head of Selected Cargo Department Skirmantė Stankevičiūtė-Bulkienė kindly told about the company's work, logistic processes, introduced the specifics of warehouses, showed how cargo collection and shipments are carried out in the company's warehouse. JSC "Schenker" has more than 140 years of logistic experience, provides optimized door-to-door delivery solutions by road, sea, air and rail. 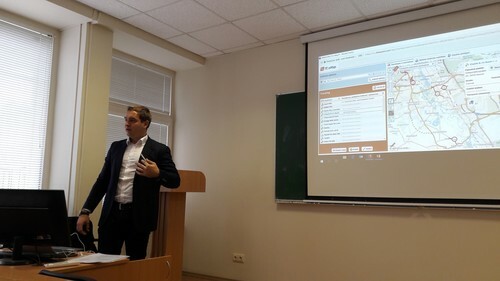 Like every year, so from this year (29 November) a lecture on the transport service platform TimoCom was read at Transprt Engineering Faculty Logistics and Transport Management Department. The lecture was delivered by a TimoCom representative Denis Pašala from Germany. During the lecture, the practical and theoretical methods of operation of this transport platform product were presented. An electronic map and tracking options were provided, familiarized with the European Freight Forwarding Program, a catalog of European transport companies, a barometer of cargo and transport and other products. Students had to answer practical questions related to specific transport and logistics problems. Long-term cooperation has given the first fruits. Practical arrangements, agreed terms and procedures were harmonized. And already in the summer one IV year student has conducted an international 3 month internship in Poland at TimoCom. About it was written in the press. The article should soon appear in Belarus. 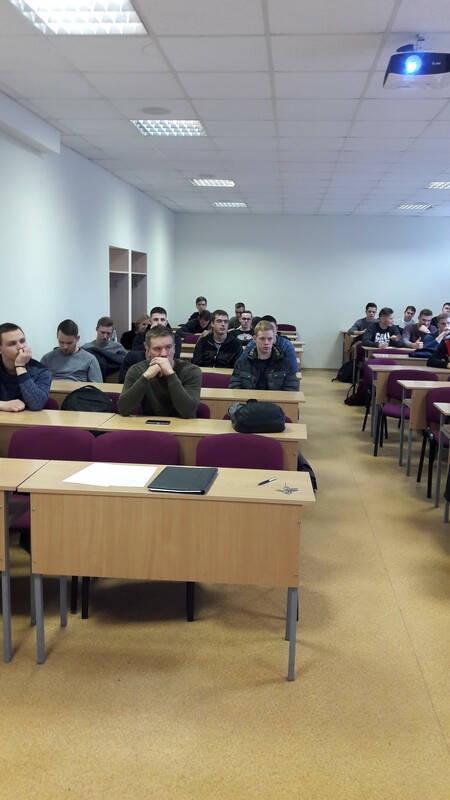 The student was provided with excellent conditions not only to get to know the job, but also to organize a trip to Germany (central TimoCom headquarters). Thematic study “Closer transport/logistics market integration through interoperability between the TEN-T Core Network Corridors and the transport networks of the EU Eastern Partnership Countries” presents the activities and main results of TENTacle project task 5.4 “Interactions between the CNCs and transport networks of the EU Eastern Partnership countries”. Which aims at finding solutions to ensure seamless traffic flow, enhance economic growth and competitiveness through interconnected subsets of transport networks (Core Network Corridors vs. Eastern Partnership countries (Armenia, Azerbaijan, Belarus, Georgia, Moldova and Ukraine) and identify priority action areas to achieve a time and resource reduction for transport operations. The TEN-T core network corridors is a new instrument of the EU transport policy, aimed to improve mobility, intermodality and interoperability on the major transport axes across Europe. The Baltic Sea Region (BSR) is intersected by three core network corridors being Scan-Med, North Sea-Baltic and Baltic-Adriatic. A broad range of stakeholders are expected to be involved in a joint action to remove physical, technical, operational and administrative bottlenecks along these corridors by the year 2030. Implementation of the three core network corridors has a large but untapped potential to stimulate positive effects in the BSR beyond the pure transport sector and beyond the immediate geographical areas they cross. Opening it up for a broader group of stakeholders and a wider geographical area requires tackling major capacity challenges. These are, for example, related with a low awareness and deficient understanding of how the CNC implementation can help improve accessibility and connectivity challenges in specific territories. And this is what TENTacle will foster in the coming years. The Department of Logistics and Transport Management (LTM) of Vilnius Gediminas Technical University is one of the partners in the international project “Capitalising on TEN-T core network corridors for prosperity, growth and cohesion” (TENTacle), co-financed by European Union (EU). The VGTU LTM is responsible for activities of task 5.4 of project - Interactions between the core network corridors and transport networks of the European Union Eastern Partnership countries. This research will present results of the mapping, inventory-making and assessment on the quality and interoperability between the core network corridors and the transport networks of the six European Union Eastern Partnership countries (Armenia, Azerbaijan, Belarus, Georgia, Moldova, and Ukraine). It will suggest priority action areas for the public and private stakeholders representing the European Union Baltic Sea Region and the European Union Eastern Partnership countries, to achieve time reduction and less resources in transport operations, thus opening up new business opportunities further stimulating the trade exchange along the core network corridors. The research will provide recommendations how to extend an operational/geographical range of TEN-T core network corridors by a strengthened interoperability and synchronisation activity of its nodes with the transport networks of the European Union neighbouring countries.